This beginning of this year till date has indeed been a roller coaster ride for Nollywood actress Omotola Jalade Ekeinde and her children. While one of her children , another from a popular well-acclaimed school named Cyprus University. Due to these jubilant events, ice-creams, coffee and exotic meals have been in tow for the actress. Not only that, a lot of smiles and happiness have lined the face of the screen goddess as she vacations in the US. 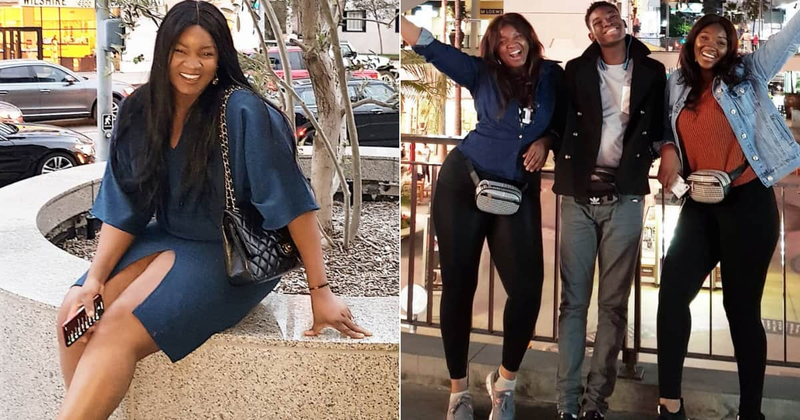 Amidst the fun-filled exciting moments she is having, Omotola Jalade Ekeinde has managed to keep her fans in the know by flooding her Instagram page with posts of herself, her children and a number of mouth-watering sights. In one of the pictures, the actress showed off a huge cone of ice-cream and cup of coffee which she said have been her best mates ever since the beginning of her stay in the US. In another picture, the bold and beautiful actress showed off her pretty body in a gown that revealed her thighs. Sitting confidently, she smiled happily in a way that showed her excitement. The photo that has, however, gotten the attention of many of her fans is the one in which she featured two of her children. The trio wore casual outfits that looked sporty, and together, they flayed their hands in the air to reveal a lot of happiness. rosetengbeh: "What a beautiful family... I love u guys very much." nwosucassi: "You have some great shots in your gallery! I mean I liked them "
sirfranklyn: "...it’s more dan 20 years I saw they film, I fell in love with u instantly I was 8 / 9 years, D character end up in prison Cos she was dating father and son... #EmekaIke #olujacob Aww in don teh love you plenty." absexy22: "Family Over Everything.. Team tallest forever ." Recently, Omotola Jalade Ekeinde had another reason to celebrate. She hit on Instagram. She took to congratulating herself and appreciating her fans for this remarkable feat.